Did Daft Punk ‘Get Lucky’? I am assuming you have caught Daft Punk’s latest song “Get Lucky”, as I have been hearing it everywhere I go, and it has taken off as a massive hit. I recently read an article by Erik Spitznagel about how Daft Punk constructed this year’s “song of the summer”, and while I agree with most of what was said, there is a crucial piece of information that was missing. The article points to the success of this song obviously due to the catchiness of the tune, but more specifically attributes the success to the way it was marketed. Spitznagel points out that their use of Billboards, teaser commercial clips, and the interactions between the traditional marketing media and its fans has directly contributed to the track’s success. I agree with everything Spitznagel has to say however I believe that he missed a key point – this track and the marketing of this song have worked as a symbiotic relationship to deliver a uniquely genuine brand promise that is consistent to what Daft Punk represents, and it is this relationship that has resulted in the tracks success. To better understand what Daft Punk’s core identity is, let’s have a look at their history. Daft Punk first rose to prominence in the late 90’s when the house music scene was reliving the nostalgia of the disco days in the 70’s. The music, the videos, and the attire, was all reminiscent of that bygone era, and Daft Punk were at the forefront of this scene. They reached the pinnacle with their track “One More Time” and the video itself is very late 70’s/’smurf-esque’. Throughout the 2000’s, Daft Punk hasn’t exactly been silent as they wrote the score for Tron: Legacy, the sequel for the 1982 hit Tron, further perpetuating their association with that late 70’s/early 80’s association. 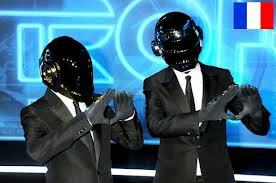 Daft Punk’s attire also has played a role in shaping what their core identity is. Both Thomas Bangalter and Guy-Manuel De Homem-Christo wear robot customs that look like what people in the 70’s envisioned future robots would look like. Why 70’s style robots? To provide an identifiable symbol to their audience that they represent a 70’s style sound that is based on electronic sounds. At the same time, both members of Daft Punk are rarely ever seen without their costume, which is done in order to ensure that the message to their audience consistently represents the message of 70’s style electronic music and does not become distorted by how they live their lives outside of Daft Punk. Daft Punk’s core identity is a fresh take on the late 70’s disco/funk scene and a focus on making the music stand for itself. As a result, it only makes sense to release their latest track using 70’s era advertising, and using very little of it in order for the music to stand on its own. As a fan of their music for 15 years, this is what I have come to expect from Daft Punk and if they had released a track that did not have that 70’s vibe and relied heavily on marketing efforts to promote their song, I would be left confused and probably not have cared much for the song. Therefore, while I agree with Eric Spitznagel’s dissemination of why he thinks Daft Punk has succeeded in creating a “song of the summer”, I also believe that Daft Punk has been able to do this by focusing on who they are as a group, and successfully delivering on this promise in everything that they do. Posted on July 29, 2013 by Giampiero. This entry was posted in Uncategorized. Bookmark the permalink. If I had to sum up the Daft Punk phenomenon in one word, it would be this: Authentic. That’s marketing that people respond to. Pingback: INSIGHTS ON MARKETING » Who Are You?